A little bold, I know, but you have to understand how much this means to my husband. It's no surprise that Kevin loves sports. Football, basketball, baseball, all of the X-Games stuff, winter sports, you name - Kevin loves it. Mostly he watches on TV. We have been able to attend a few Sonics games (back when Seattle had a team) many, many Mariners games (our favorite) and lots of local hockey and baseball games. We even attended EVERY SINGLE Southridge High School Football game this year. My man loves his sports. It's also no surprise that he enjoys basketball most of all. Jacob started his basketball season a few weeks ago and the conversations these two have about the game just crack me up. Kevin loves to give Jacob pointers about what he should be doing on the court. It's fun for me to watch and listen to these two. When we were first married and lived in Kennewick, they had a YM Church Basketball league and Kevin was our ward YM coach. We won the Stake title a few years in a row and can you believe that Kevin even got a TECHNICAL called on him once while he was coaching a game!! He gets a little intense. I know its hard to believe, but it's true. ANYWAY - His favorite to watch on TV is College Basketball. His favorite team - can you guess? 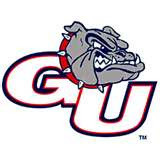 GONZAGA!! Yes! he is Mormon and YES! that is a catholic school - so what? He LOVES this team. When he was younger, he played in Spokane's' Hoop Fest a few times. He was able to watch the Zags players shoot around and play before they were "on the map". He really enjoyed watching them. When they started televising their games more and more he would watch - every game. Lucky for him, his wife also enjoys watching sports. I can get a little intense myself at times. Poor Jacob, I may embarrass him very badly some day. Yes, I am one of THOSE moms when watching sports. He has all of the gear - hats, shirts, sweatshirts and shorts. You can sometimes find him wearing ALL of this gear while watching a game. I had a cousin who attended GU back in 1999, and I would ask her to try and get me tickets for Kevin. She always told me that it was really hard to get tickets and you had to stand in long lines for hours. SO I was never able to get any tickets. Then when EBay became popular, I tried to get tickets that way. GOOD LUCK! That bidding always got way too high for my humble little pocket. Still, every year I would try and try to get tickets. He would say that it was no big deal. It was better to watch on TV anyway. 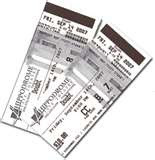 For about TEN years now I have tried to get tickets without breaking the bank. So again, this year the hunt was on. I went to EBay - too expensive. Then I tried Craigslist. This was better, but I would usually respond to a post and they would say "I got an offer that is higher than yours." Then I would say thanks, but no thanks. So frustrating. All I want are two tickets to a Zags game that is not gonna put us in the poor house. A gift for my well deserving husband!! Is that too much to ask? I submit a post to Craiglist myself - WANTED 2 Zags Tickets Any Home Game. A very nice man who is a season ticket holder replies and says he has tickets to a game, that he will sell me for a very good price, that happens to be on the same night as Kevin's Cousins' wedding reception. GRRRRRR! So I reply thank you but I am busy that day. Sigh. January 16, 2009. I am on the computer Friday evening checking my email and stuff. Kevin and I are talking. I am just about ready to click off of my email for the night, when a message appears. I look at who it's from, but don't recognize the name. All it says in the "about" line is Tickets. Kevin is still talking to me but I am not really listening because I have been intrigued by this message. I click on it and it reads, "I am sending out this email to those who have responded to my ads in the past. I have tickets to the best three home games this year. I scheduled a vacation months ago that happen to fall on these game days. Will sell individual games to the first to reply." I read the dates and opponents and the price he is asking and I literally screamed and jumped. Kevin is looking at me like I am NUTS. As I hit reply and am typing as fast as I can go, I tell him what I just read. I can't keep a secret from him okay, especially a good "surprise gift" like this. Without even discussing the price or which game I hit send, requesting the Saturday game at the price he listed. I wait for what seemed like an ETERNITY. The same man who offered me the tickets that I couldn't use because of the wedding was the man who had posted these tickets. He was shocked as to how quickly I replied. I laughed. He said since I was the first to reply he would sell me the tickets, but I had to meet him in Spokane with the cash. I frantically email him back explaining that I live in Tri-Cities and I really want these tickets as a gift for my husband, I will send him a check ASAP. He was a little hesitant. I BEGGED him not to sell the tickets. 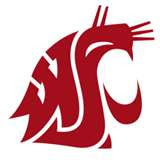 I would find a way to get to Spokane and get those tickets. He agreed to hold them for me. Lucky for me (and Kevin) Monday the 19th was MLK day. No school. I got up early, packed the kids in the car for a road trip. I let the man know I was coming to Spokane and he told me he would be in his office that day. I got directions and off we went. My sister Ashley went with me and the whole way there she's like, "Are you sure this is legit? ", "Are you sure it's safe? What if he is a psycho?" Not helping Ashley!! When we pulled up to the building, it looked like a very expensive nice building. I was to meet him in the lobby with the cash. Sounds like a scary movie, right?! I was a little nervous, I have to admit. Ashley told me she had my back, oh I feel so much better now. I walk in and look around. Very nice building, waterfalls, offices for lawyers and CPA's, etc. I see the elevator door open and a man that I promise was like 7 feet tall comes walking out. I am only 5'1" on a good day. I see the tickets in his hand and he is looking around for someone. You see, usually when I tell someone I have never met before what my name is, they picture and average height, Caucasian woman, not a short, Hispanic woman. So he is looking around and he looks at me curiously and says "Are you Amy?" I says yes and hold out my hand to shake his hand. It's awkward because 1) He wasn't expecting me to be me and 2) He is like over two feet taller that I am! I hold out the cash and he hands me the tickets. YES!! I tell him repeatedly how thankful I am and how excited my husband will be and how nice it was of him to sell me the tickets at FACE VALUE!!!! SCORE!! Finally after so many years of trying. But wait, it gets better. He leans over to point out the tickets to me. I chose to buy the tickets for the Saturday game (February 7) knowing it would be better for a sitter and an out-of-town trip, not caring who the opponent was. He points out that the game is against MEMPHIS. (Ooh, good match up, how exciting!) The game will be played at the Spokane Arena, instead of the Zags McCarthy Center. (Awww, too bad, at least we got tickets to a game.) Oh and it will be an ESPN Nationally televised game,(WHAT!! ARE YOU KIDDING ME!!!) I am beyond thrilled. I again overly shake his hand and turn out to the car skipping the whole way to tell my sister. Like I said before, I can't keep a secret from Kevin so I call him right away and tell him the news and he is just giddy. "That's AWESOME!!" Is all he can say. I have him look up the seats on-line and they are pretty good. He then looks up to see how much these tickets are going for on EBay. Get this - $198 PER TICKET!!! I got TWO tickets for less than $100 a piece. Kevin has told all of his buddies and anyone who will listen about his gift from me. He is so excited, I can't even tell you. I am trying to convince him that he doesn't need to paint his chest and go all SuperFan on me. We will see. So this is why I have nominated MYSELF for wife of the year!! You might remember this post from a few months ago. Well, the verdict is in and YES, Kayla does need glasses. Doesn't she look just BEAUTIFUL!! We had to wait until January for her eye exam because we didn't have vision insurance back in October. We enrolled in November and it went into effect in January. We went to see the nice eye doctor who confirmed what the school thought. I had a HUGE headache because I really didn't think she was going to need them, then they tell you the cost of the frames and lenses. Headache increases. We find out that our new insurance is about the worst insurance in the world, it doesn't cover anything and no one accepts it. Migraine. She tries on a few different frames and I just don't like ANY of them. None of them look right on her cute little face. She falls in love with this HUGE electric purple pair that she thinks she just has to have. I convince her that we need to go home and discuss it with daddy and shop around. I talk to a few friends and get some advice. We shop around and our last stop is at good old dependable Wal-Mart. We go in and are immediately greeted by the nicest man who helps us and walks me through this whole process. She finds this pair of adorable Hannah Montana purple glasses with pink stars all on her own, tries them on, and we both smile immediately from ear to ear. These were the ones. They were perfect!! Then I thought okay well, lets check out the price. Mr. nice manager dude tell us the price, and can you believe it that they are CHEAPER at Wal-Mart without my insurance, because again, nobody accepts our insurance that doesn't cover anything anyway, than it would be to go to our doctor's office, or any where else using our insurance. I was blown away. We go ahead and order and pay for them, that's how inexpensive they were, and Mr. manager dude says they'll be in in 7 days. We thank him and go home. Kayla asks everyday, when her glasses are coming in and I keep telling her a few more days, a few more days. Well, can you believe, that only 4 days after we ordered them, Mr. Manager calls us at home and tells us that they are in!! WOW!! This is a better experience than I ever could have imagined. I was a dork, and Kayla is cute and adorable and says that now that she has glasses she wants to be a teacher at Maya Angelou when she grows up. I know the holidays are over, but I didn't ever post any pictures of Christmas so I am doing it now. This is a picture of Jacob in his new sparring gear that he got from mom & dad. He was very excited to receive this gift. Now he can enter a Tae-Kwon-Do Tournament. Kelsie is getting her hair washed at Salon Olson. It's very hard to get an appointment. The stylists at Salon Olson are magnificent. Lucky customer, Tyson Olson, receiving the VIP treatment. Oh, and we also have a live band performing while you get your hair done. It features lead guitarist Jake "Rock Man" Olson. Why do we love Edward? Is this the Answer? My wonderful Mother-in-law sent me an e-mail with this article in it. Lorrie, I hope you don't mind me blogging this:) You should know that she recently finished reading the entire Twilight series after listening to all of us go on and on about it. You should also know that she was contemplating putting an "I heart Edward" widget on her blog page. Oh, I also failed to mention that my father-in-laws name is Edward. Anyway, I found this article VERY interesting. The author gives you something to ponder. She may be on to something here. I found it very enlightening. After you read this article, I would LOVE to hear your thoughts and comments about it. It seems like FOREVER since I have been in blog land which is very sad to me because I LOVE blog land. I have just had a rough time getting back in the groove since after the holidays. I feel like I have had so much catching up to do and not enough daylight to get it all done. Today I feel like I am finally getting a handle on things. So I excitedly sit down to type something out and I think, "Where do I start?" So many little things have happened in our little home. I think I have plenty of writing material, let's h ope I can continue to have the time to write it out. Today, I am choosing to write about bedtime. Why is getting the kids to bed and in a "normal" bedtime routine so hard for us? Well, part of it is because I worked for 6 years outside the home in the evenings. Guess who was in charge of a bedtime routine - not me!! Usually when I would come home at nights everyone was in the living room asleep on the floor or couches. Television on, toys and stuff everywhere. Then I had to move them to their beds. Some nights they would wake up and I would have to help them fall back to sleep. There was no routine or schedule during those 6 years, they just fell asleep when they fell asleep. It didn't bother me then because I wasn't at home to deal with the late nights. Kevin did the best he could after coming home from working all day to have to watch three kids all by himself. Not an easy job. A little over a year ago, we were blessed with being able to have me stop working outside the home. This made our family so happy. For a few months it was hard, not having "a life outside the home". I had to rely on contact with adults at church or visiting teachers who I never wanted to leave. I had to work on adjusting myself to staying home full-time, tougher than it sounds, believe me. Since the beginning of this last school year in September we decided that there is no reason why the kids should be up so late. We need time in the evening to have adult conversation, get church callings done and just BE, ya know? So we instilled a bedtime routine. Pajamas on and teeth brushed at a certain time, books read, prayers said and into bead. Piece of cake, right? WRONG!!! They have fought us every step of the way. They do not like having a bedtime routine at all. I always use one line on them that they totally hate, "Every other kid that we know is in bed right now, why aren't you?!?!" They have such a hard time. We tell them they have to be in their rooms but not necessarily asleep, they can read or draw. They just don't like to be in their rooms alone. We spend all night going back and forth from room to room trying to calm them down and get them to stay. It's so frustrating!!! Then once the holidays hit it's even harder because we are never home. We are out visiting family and friends and aren't home in time to instill the routine. What's a mother to do? I know most of you all have little angles that are in bed by eight and you get a lovely evening to yourself. This is my dream. I know for most of you it's an easy bedtime routine. Not for us, we are still trying. Every night we go through the same thing. I keep telling myself consistency is the key. Since the beginning of the new year, I decided to make little charts of "Daily things to do" for each one of them to mark off and keep track daily. Things like brush teeth, say prayers, read scriptures, GO TO BED ON TIME, etc. With each task that is done, they get a point. Once they have reached X amount of points individually, we get to go on a family outing either bowling or ice skating. Since we started this little reward system, I think, maybe, we have more of a routine showing up in this house. It's not perfect yet, but slowly, we are getting there. We have found that we can't skip a night because then they have a hard time getting back on track the next night. This is another challenge because then we can never go anywhere. 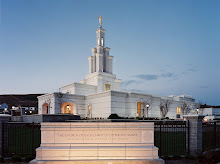 Like this coming Thursday, Kevin and I are going to the Temple. This means the kids will be at my moms' house. Which means that after a session and hopefully a bite to eat afterwards, we will be home very late. Do you see what I mean. Then Friday night will be hard to get back on track. This has been my CHALLENGE. Every night. We all know it's coming. SO my hope is that by the end of the school year they will be in a good little routine that we can depend on and I can get some quiet evenings. Then guess what happens. SUMMER!! Does this mean I will have to start all over again come fall? It's a never ending vicious cycle. I dare say that bedtimes will be a challeneg for me and my little family for a long time. Sigh.